'The Walking Dead' Season 7 Confirms Ezekiel and Shiva? The Walking Dead has more mysteries to address in Season 7 than who fell under Negan’s bat “Lucille,” namely those mysterious armored friends encountered by Morgan and Carol. Comic fans likely know their identity, though the series itself may have leaked two fan-favorite additions for Season 7, who might roar our as early as the trailer. 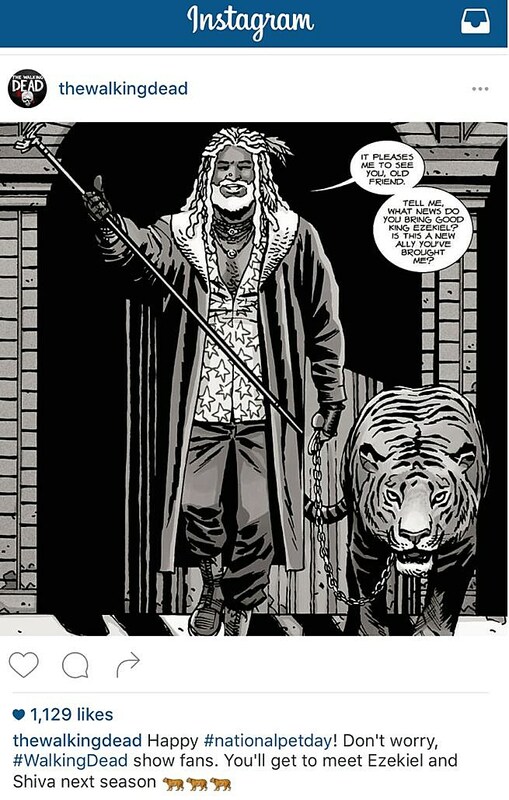 Take this with a grain of salt for now (as well some minor spoilers), but fans of the original Robert Kirkman comics well-recognized the armored rescuers as “Knights” of fellow survivor community “The Kingdom,” in the comics ruled by the dreadlock-sporting “King Ezekiel” and his pet tiger, Shiva. Showrunners have been understandably cagey about confirming either figure for Season 7, but the comics’ Instagram account may have spilled the beans. That would certainly help the trailer, given the difficulty poised by previewing any scenes from Season 7 without revealing Negan’s victim (or by process of elimination, his survivors). We’ll likely hear an Ezekiel casting over the summer, should the leak prove true but should Walking Dead fans have hope for the full comic treatment? Will a freakin’ tiger be enough to lure back irate viewers?